Discover Whiter Teeth in Twenty-Minutes! Across the nation, many people find their smiles fading as their teeth become discolored and stained over time. Daily activities such as drinking coffee, tea, wine, or sports drinks and consuming certain foods such as berries, tomato sauce, and candy can quickly change the appearance of teeth. No matter how much one brushes their teeth, these stains are simply impossible to remove. Thanks to a new service called Start Pure Professional, patience can now see their teeth transformed back to a whiter appearance in as little as twenty-minutes! Listed below are four of the most common questions about Start Pure Professional and answers about how this great service can help you achieve the bright smile you want. Why Should I Whiten My Teeth Through My Cosmetic Dentist in Monterey, California? While some people may think that having their teeth whitened is simply not worth the time and effort, this is far from the truth. Having whiter teeth is a confidence booster that helps individuals to feel more certain about themselves and their smiles during job interviews, reunions, weddings, and dates. When someone has increased assurance of their abilities, it will impress those around them, making it more possible for them to succeed in life. With a Start Pure Professional teeth whitening service in Monterey, California, patients are able to see their teeth visible whiter with a 20-minute session. A cosmetic dentist such as those on staff at Monterey Dental Contours can quickly reverse the hands of time and make teeth brighter than ever, leaving the patient feeling confident, enthusiastic, and even younger! Just like any procedure, teeth whitening services come with side-effects; however, thanks to Start Pure Professional’s natural ingredients, patients who have their teeth whitened with this product rarely experience any severe or painful effects following the procedure. Generally, patients who use Start Pure have no pain or very limited discomfort. For those who do experience some mild discomfort, it usually lasts between a few minutes to a few days, and is not bad enough to require medication or a change in activities. 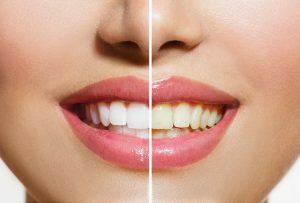 In some cases, gums may turn a white color following the procedure; however, they will return to their normal color within a few minutes to a few hours. When applied by an experienced cosmetic dentist in Monterey, Start Pure can change the color of one’s teeth by making them five- to eight-shades whiter than they were before the procedure. Start Pure has the ability to turn back the hands of time and even make a patient’s teeth brighter than ever before, giving them a smile they will be proud to show off. Once a patient has received a Start Pure 20 minute tooth whitening service, they will notice that their teeth are noticeably whiter. The results of this procedure often result in whiter teeth for up to one year! Don’t Wait: Visit Monterey Dental Contours Today! The staff at Monterey Dental Contours is excited to offer this revolutionary tooth whitening system at their office. With an easy and fast application, this whitening service is perfect for those who want whiter teeth but don’t have the time to waste on lengthy procedures. If you suffer from discolored teeth or simply want to discover a whiter smile, contact the team at Monterey Dental Contours today and discover how the Start Pure Professional services might be the right fit for you!